January 2016 47 Frederick Law Olmsted had designed decades earlier for his Biltmore estate. A pergola similar to the one Esarey found in the archives was constructed within the Olmsted site. Elements not considered in 1938 were built away from the Olmsted area to protect the integrity of the historic designation. This included the pool house, the pool house patio and spa court, an outdoor dining facility and a few other amenities. 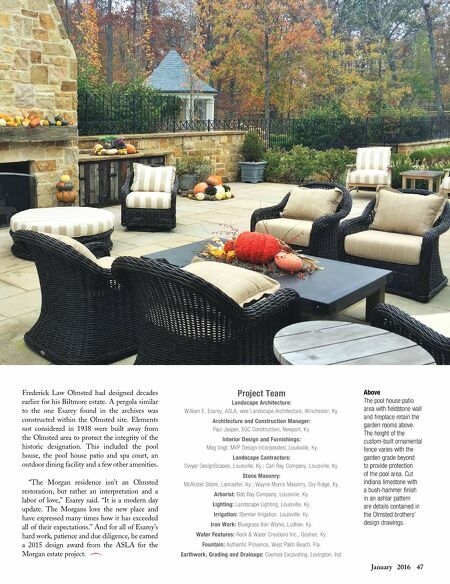 "The Morgan residence isn't an Olmsted restoration, but rather an interpretation and a labor of love," Esarey said. "It is a modern day update. The Morgans love the new place and have expressed many times how it has exceeded all of their expectations." And for all of Esarey's hard work, patience and due diligence, he earned a 2015 design award from the ASLA for the Morgan estate project. 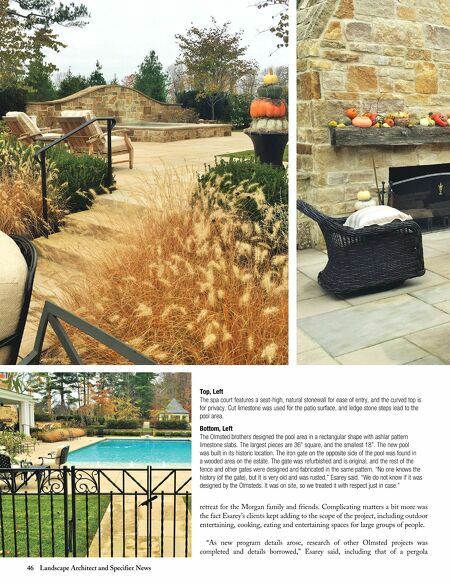 Above The pool house patio area with fieldstone wall and fireplace retain the garden rooms above. The height of the custom-built ornamental fence varies with the garden grade beyond to provide protection of the pool area. Cut Indiana limestone with a bush-hammer finish in an ashlar pattern are details contained in the Olmsted brothers' design drawings. Project Team Landscape Architecture: William E. Esarey, ASLA, wee Landscape Architecture, Winchester, Ky. Architecture and Construction Manager: Paul Jasper, EGC Construction, Newport, Ky. Interior Design and Furnishings: Meg Vogt, MVP Design Incorporated, Louisville, Ky. Landscape Contractors: Dwyer DesignScapes, Louisville, Ky.; Carl Ray Company, Louisville, Ky. Stone Masonry: McAlister Stone, Lancaster, Ky.; Wayne Morris Masonry, Dry Ridge, Ky. Arborist: Bob Ray Company, Louisville, Ky. Lighting: Landscape Lighting, Louisville, Ky. Irrigation: Stemler Irrigation, Louisville, Ky. Iron Work: Bluegrass Iron Works, Ludlow, Ky. Water Features: Rock & Water Creations Inc., Goshen, Ky. Fountain: Authentic Provence, West Palm Beach, Fla. Earthwork, Grading and Drainage: Coomes Excavating, Lexington, Ind.